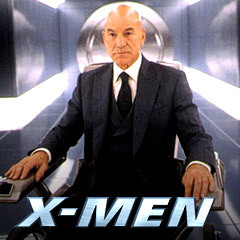 Before the credits, Professor Charles Xavier (Patrick Stewart) narrated (in voice-over): "Mutation: it is the key to our evolution. It has enabled us to evolve from a single-celled organism into the dominant species on the planet. This process is slow, and normally taking thousands and thousands of years. But every few hundred millennia, evolution leaps forward." 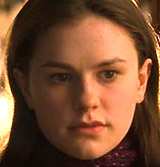 In another prologue scene set in modern times ("in the not too distant future") in Meridian, Mississippi, 17 year-old teen Marie D'Ancanto (Anna Paquin) flirtatiously kissed her boyfriend David (Shawn Roberts) - and accidentally put him into a coma (for three weeks) when she absorbed his life energy with her latent mutant power. Fearful and alienated, she ran away from home and fled to Canada. The next scene shifted to the US Senate, debating a controversial bill, the Mutant Registration Act. Mutant rights-advocate Dr. Jean Grey (Famke Janssen) was testifying about how mutant traits manifested themselves at puberty during periods of high emotional stress. She argued against the bill. 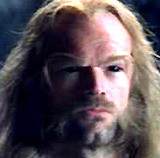 The legislation was promoted by fanatical, prejudiced anti-mutant Senator Robert Kelly (Bruce Davison) - it required mutants (superior, genetically-gifted human beings with special powers due to DNA mutation and an X-factor) to register with the government (as a minority group), thereby revealing their identity and abilities. Listening to Kelly debate the issue was his main opponent - telepathic, peace-loving, wheelchair-bound, bald X-Men founder Professor Charles Xavier (Patrick Stewart). Also present was the powerful leader of the militant, animalistic Brotherhood of Mutants - embittered Magneto (Ian McKellen), Xavier's ex-ally (and Holocaust survivor Eric Lensherr with a number burned into his arm) who could create magnetic fields and control metal. In Northern Alberta, Canada, Marie had hitchhiked by truck to Laughlin City, where truck stop drivers were watching a caged fight between short-tempered, sensory-keen Wolverine/Logan (Hugh Jackman) and a vanquished opponent. With his strong body frame supported by a surgically-grafted metal alloy (adamantium) skeleton, he remained "King of the Cage" - a way for him to make a meager living. At the bar where she was drinking water, the anxious Marie met Wolverine (dog tags displayed his name) ordering a beer. [The TV broadcast announced an upcoming UN summit - the "largest single gathering of world leaders in history" to be held on Ellis Island.] Wolverine, considered a mutant "freak" when he scuffled with disgruntled and defeated fighter and revealed his long razor-sharp retractable metal claws, was ordered from the bar. He reluctantly let Marie join him, and she introduced herself as Rogue. Wolverine and Rogue were brought to Xavier's X-mansion (in Westchester, NY), where he had congregated a special group of good mutants. Mutant students in "Xavier's School for Gifted Youngsters" (Mutant High) were taught peaceful co-existence between humans and mutants, and ways to control their unusual powers. One of the new arrivals to be instructed included runaway Rogue/Marie, with her unfortunate lethal ability to drain a human's life-energy through simple touch. [She was incapable of physical human contact. However, in the case of super-powered mutants, she could temporarily absorb their abilities through touch.] 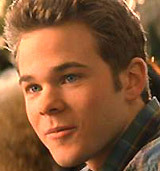 One of the other students, Bobby Drake (Shawn Ashmore) took a liking to Marie, and demonstrated his "Iceman" ability to transform the moisture in the air into a frozen ice sculpture. Xavier introduced Wolverine to the mansion's Dr. Grey (with telekinetic and telepathic abilities), and to Cyclops and Storm who had saved his life. Acting belligerently, Wolverine was reminded that his memory was lacking over a 15 year period as he nomadically roamed as a loner. 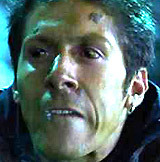 It was stated that they should plan against "angry and vengeful" Magneto who wanted a war with humanity. His belief that humans and mutants could never co-exist lead to the separation of Magneto and Professor Xavier in the past. Kelly was flown to Magneto's island fortress. There, Magneto demonstrated how he could profoundly amplify his abilities with a test mutation machine that he had built. His device emitted radiation that triggered mutation in the body of Senator Kelly. The politician was artificially transformed into a mutant with a malleable, jelly-like body, able to stretch into pliable shapes. He fell from Magneto's fortress into the water during an escape attempt, and was washed up on a beach where sun-bathers were astonished at his pale water-logged skin. 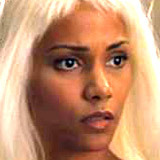 In the meantime, Mystique shape-shifted to impersonate Bobby, and convinced Rogue to leave the Mutant School. She falsely believed that Prof. Xavier was furious at her after other students were supposedly "freaked" when she temporarily absorbed Wolverine's healing powers (he had accidentally impaled her chest with his claws during a nightmare). Realizing that Rogue had disappeared, Xavier used his massive Cerebro supercomputer invention (co-built with Magneto) with a helmet interface to locate mutant Rogue at a long distance away - at a train station. Although the Professor asked Storm and Cyclops to retrieve Rogue, Wolverine hijacked Cyclops' motorcycle, raced to the station and found her on a departing train. He convinced her to return to the Mutant School. At the same time, Bobby (Mystique in disguise) entered Xavier's mansion and proceeded to Cerebro, in order to sabotage its circuitry. A train station fight broke out between Storm and Cyclops after Toad and Sabretooth arrived to capture Rogue. Cyclops sent out destructive red laser-eye bolts into the ceiling and Storm summoned lightning to combat them. Magneto intercepted the train, subdued Wolverine, and took Rogue away with him to join his other two compatriots. Outside the train station - now surrounded by officers, his metal-controlling powers crashed police cars and made the cops' weapons ineffective. A telepathic standoff between Magneto and Xavier ended when the Professor gave in - to prevent any casualties. It was revealed that Magneto needed Rogue's powers - he had been weakened by his machine when it drew power from him during Senator Kelly's mutation. He needed to strategically absorb her mutant ability into himself in order to power his machine, although it would mean her sacrifice. Senator Kelly stumbled into Xavier's mansion, suffering deadly consequences from his artificial mutation. His unstable body (with a broken-down cell structure) was rejecting the unnatural mutation it had suffered. He dissolved or disintegrated into a puddle of water, as he told Storm: "I think you've got one less person to - to be afraid of." Professor Xavier again donned a helmet in Cerebro to detect Rogue's (and Magneto's) whereabouts with its enhanced psychic ability - but because the machine had been sabotaged, he went into a coma as he fell from his wheelchair. It was clear that there would be deadly consequences (demonstrated by Kelly's death) if Magneto unleashed his mutating machine on all of humanity - and as Storm put it: "He doesn't know his machine kills." Magneto's grand, radical take-over objective was to win the "war between mutants and the rest of humanity." He would drastically demonstrate his plan during the UN summit of the world's powerful leaders on Ellis Island - mutating all of the participants with his machine so that all the world would be equal ("they will return home as brothers, as mutants. Our cause will be theirs"). After fixing Cerebro, Dr. Jean Grey realized the location where Magneto was setting up his machine - in the torch-hand of the Statue of Liberty on nearby Liberty Island. In the film's climactic conclusion at the Statue of Liberty (on Liberty Island) within sight of Ellis Island, a desperate struggle occurred after the X-Men arrived in a stealth jet and fought against Magneto's Brotherhood of Mutants. At first, Toad (with his long prehensile tongue and the spitting of suffocating green slime) and Mystique (shape-shifting into Logan) were formidable adversaries. But they were incapacitated by Storm (who warned: "Do you know what happens to a Toad when it's struck by lightning? 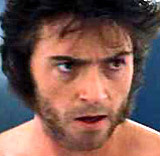 The same thing that happens to everything else") and by Logan, who stabbed his opponent. With the arrival of Sabretooth and Magneto, the X-Men were imprisoned by twisted metal. Magneto was insistent on carrying through with his lethal plan - aiming his machine at Ellis Island: "Those people down there, they control our fate and the fate of every other mutant. Well, soon our fate will be theirs." In a fierce one-on-one struggle atop Lady Liberty's crowned head, Wolverine fought Sabretooth, but was thrown part-way off the Statue. With a laser blast, Cyclops propelled Sabretooth out of the forehead of Lady Liberty. Using Storm's forceful wind power and Jean Grey's telekinetic steadying, Wolverine was guided to Magneto's rotating mutation machine to stop its effects and save Rogue. The stand-off between Wolverine and Magneto ended with another laser blast from Cyclops - Magneto was dislodged and wounded, thereby defeating his evil plan and destroying the machine before the mutational effects reached Ellis Island. As she was dying, Rogue (with strands of white hair) was saved when Wolverine held her close and again transferred his regenerative abilities to her. 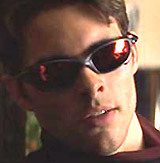 The film ended with Xavier reviving from his coma. 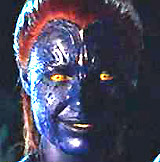 Mystique was still alive, shape-shifting herself to impersonate Senator Kelly on a TV-news broadcast, and explaining how he was wrong about the issue of forcing the passage of the Mutant Registration Act. And Wolverine departed for an abandoned military compound near Alkali Lake in the Canadian Rockies to find answers to his mysterious past. He gave his dog tag to Rogue for safe-keeping ("I'll be back for this"). Although imprisoned in an entirely-plastic prison cell where he played chess against Xavier, Magneto vowed to continue fighting ("The war is still coming, Charles, and I intend to fight it by any means necessary"). Professor Xavier promised to continually combat him with his X-Men ("And I will always be there, old friend"). This initial superhero action/adventure film in the series was based on Stan Lee's Marvel Comics characters of the mid-1960s and after. With the tagline: "Trust a few. Fear the rest." With a production budget of $75 million, the film grossed $157.3 million (domestic) and $296.3 million (worldwide). It was the lowest-grossing film of the original trilogy. Set-pieces: the climactic battle between the X-Men and Magneto's Brotherhood of Mutants, set on Liberty Island (the Statue of Liberty).